Coinbase is launching its own cryptocurrency index fundWhen you're the runaway leader in a growing industry, you typically have two opinions: A) Stay in your lane and let other companies pop up to solve the industry's problems, or B) Try to offer as many products as possible and own the entire customer experience from A-Z (no Amazon pun intended). Coinbase Eyes Bitcoin ETF With New Cryptocurrency Index FundInvestors can now buy Bitcoin, Ethereum, Bitcoin Cash and Litecoin through a new Coinbase cryptocurrency fund, instead of on the exchange. Coinbase announces launch of cryptocurrency index fundNEW YORK (Reuters) - Digital asset exchange Coinbase announced on Tuesday the launch of its first-ever index fund, marking the company's foray into asset management. The U.S. firm, the largest cryptocurrency company in the world and most recently valued at $1.6 billion, has formed a subsidiary called Coinbase Asset Management to oversee the new Coinbase Index Fund, product lead Reuben Bramanathan told Reuters. 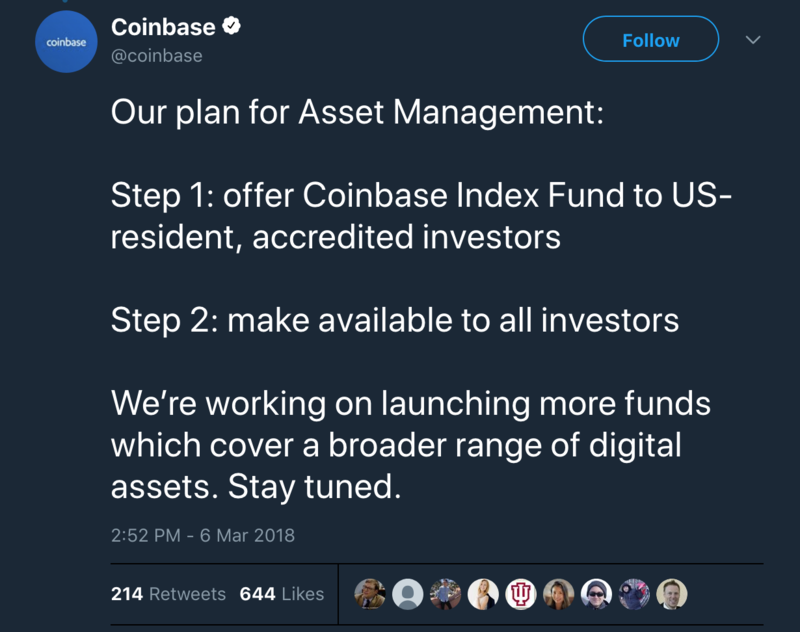 Would you recommend Coinbase Asset Management to a friend? @harryraymond "Only 4 cryptos in Fund" Yea, I agree. I can already buy those 4 crytos on coinbase... why wouldn't I just do it on my own? @harryraymond 2% management fee for an index fund is absurd. I see 2.5% on Bitwise. The fund needs 10x the currencies 1/10th the fee. What is the justification for the management fee?? 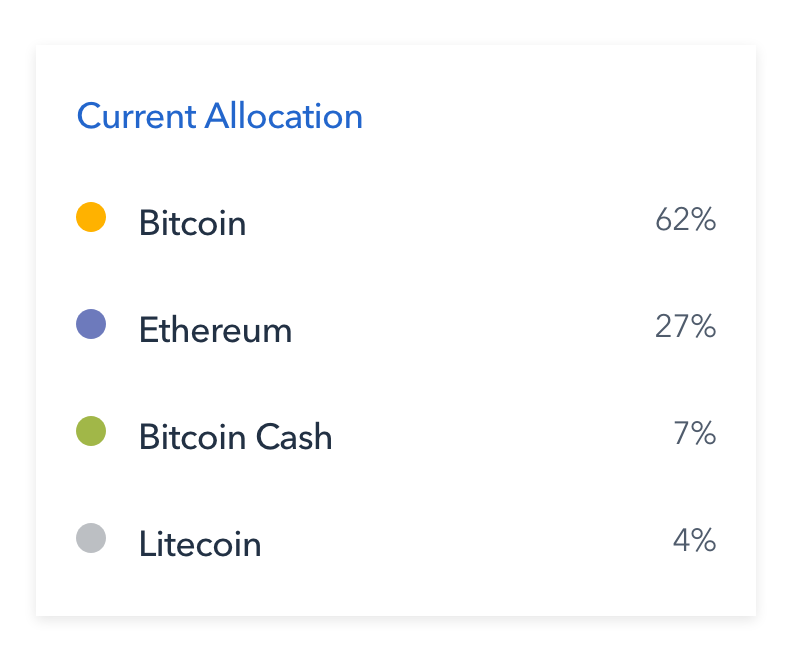 @chrismessina in comparison, Bitwise HOLD index fund is currently investing in: BTC - 50.0% ETH - 21.4% XRP - 10.1% BCH - 5.8% LTC - 3.7% EOS - 2.4% XLM - 2.1% DASH - 1.6% NEO - 1.7% XMR - 1.3% They rebalance the index every month to focus on the coins with the highest market cap (and a few other things) to provide a relatively stable investment opportunity (emphasis on relative 😊). Props to @brian_armstrong and team for moving so quickly. 👏👏 Managing a diversified cryptocurrency portfolio is difficult for anyone: between different wallets and exchanges, it's akin to taking on a part-time job. Coinbase's new product helps accredited investors quickly invest in the broader cryptocurrency market, without the hassle. 2% is hard to swallow, but worth it to not have to think about personal security and wallet management. Curious to see the pricing model evolve as more of these launch. Coinbase also isn't alone in the crypto ETF/hedgefund space: Metastable Capital launched over the summer to much fanfare, and more traditional "blockchain VCs" like Polychain Capital have been around for years, leveraging their expertise to get pre-launch token allocations in the hottest blockchain startups.